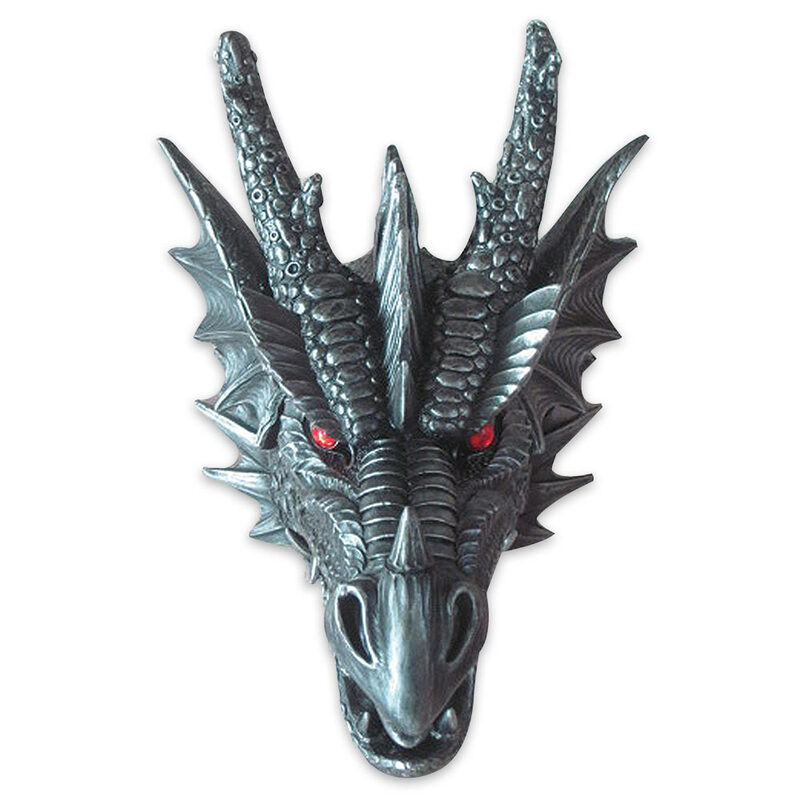 Dragon Head Wall Hanging | BUDK.com - Knives & Swords At The Lowest Prices! The Dragon Head Wall Hanging is a ferocious looking piece of wall art that will get your guest’s attention for sure! If you love fantasy pieces, this is a must-have for your collection. The highly-detailed, sculptured dragon head is cast from durable resin and features an intricate texturing that contributes to the realness of the piece. In addition, it is further highlighted with red glaring eyes. This wall hanging is 16” X 10” X 10”. I've always liked anything to do with dragons, from books to statues to pictures and music boxes. I've been renovating the attic to look like the inside of a castle hall and need some decor to make it come together. I saw the Dragon head and thought it would be great to have one on the wall (Game of Thrones?). I wasn't sure if the detail would be there. When I opened the box ... WOW... SO AWESOME... the detail is great... the size will blow you away... makes for a great piece... and I couldn't have done better as I got two of them on a BOGO deal with FREE Shipping... if you like dragons you gotta get one... you won't be sorry. Just received my ordered dragon’s head. Am currently working on a novel which includes a dragon which gets its head lopped. So had to have this. It is about a classic appearing dragon just like the dragon head I just received. This thing is moderately heavy. it is not a thin plastic shell. Looks and feels as though it is cast metal. The coloration is not bad. Dark and moody.with red eyes. If you need a dragon head I recommend getting this one. It serves its purpise well..